The Brown Pelican (Pelecanus occidentalis) is a large seabird found on both coasts of North America, as far away as the Galapagos Islands, and unique to California, far inland at the Salton Sea. They have an iconic silhouette and are recognizable for their brown and gray feathers and fuzzy white or yellow heads. Worldwide they are one of the smallest species of Pelican, but also one of the most active. On land the Brown Pelican appears a little clumsy due to their oversized neck, long bill and shorts legs. They often nest and congregate in large groups on sandy islands or cliffs where they build simple nests without fear of predators. Once the nest is made Pelican pairs raise their young together in broods of 2 or 3. For many years the Brown Pelican was a rare sight along the California coast and elsewhere as the pesticide DDT caused their egg shells to be too brittle and were crushed. Since the ban of DDT the Brown Pelican has made a terrific comeback and they are a common sights along the coast and in the air. 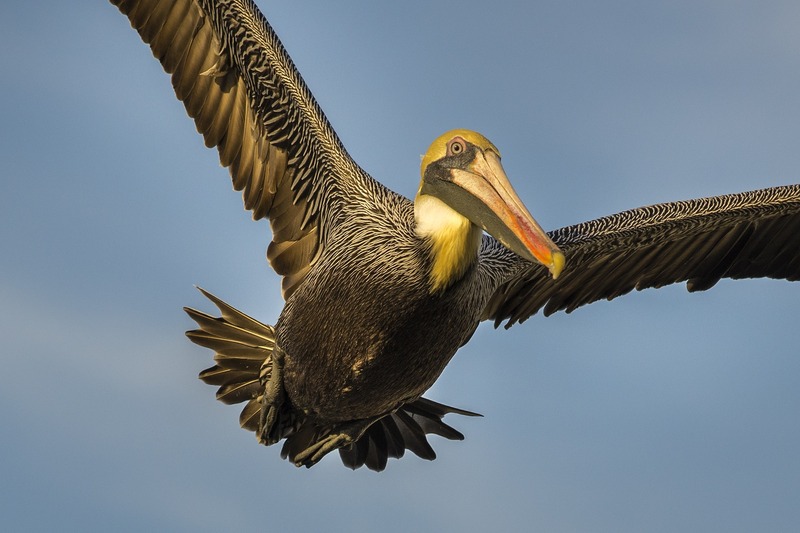 Once in the air, the Brown Pelican is a graceful pilot that flies either alone or in large V formations soaring high on wind currents rarely flapping their wings. With their heads tucked in, the Pelicans assume a streamlined shape and then like a precision flying team they will barely skim the water and follow the contours of incoming ocean waves. While silently gliding just inches above the water, the Pelicans make almost imperceptible adjustments to their six foot wingspans obtains maximum glide and efficiency. The Pelicans often look like they are surfing, following the face of the breaking waves and making graceful turns staying just ahead of the curl. From the vantage of a surfboard you can see the Pelicans barely drag their wing tips across the glassy surface of the water while they noiselessly do a flyby almost close enough to touch. When it’s time to eat, the Pelicans assume a different flying style, that of a dive bomber. 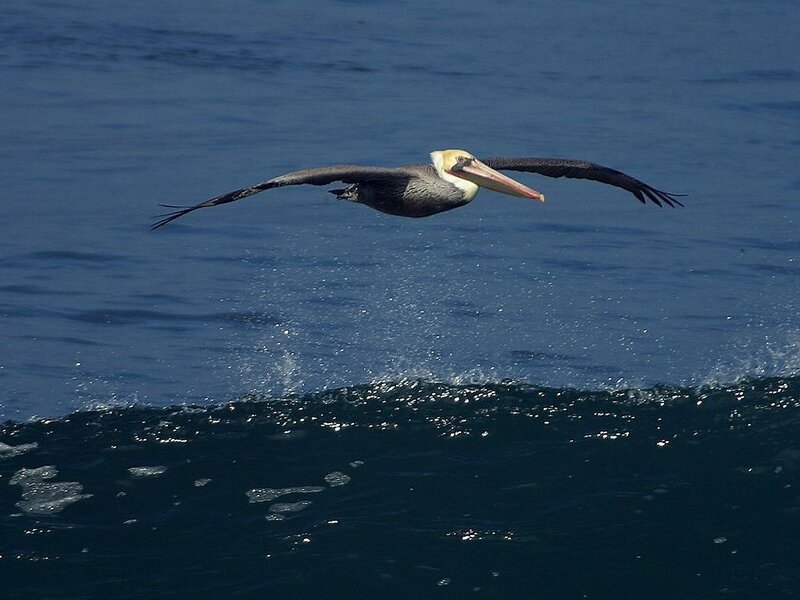 Circling 60 feet or more above the surface of the water the Brown Pelican will scan the area below for a fish. Once they spot their unsuspecting meal they will fold their wings back and go diving straight down reaching speeds of over 30 miles per hour. The Pelican hits the water with sufficient force to stun the fish and capture it in its beak. The Pelican is protected from the crash by air sacks beneath the skin on the bird’s chest. Once the fish is captured, the Pelican drains up to four gallons of water from its expandable throat pouch and then consumes the fish whole. An adult Pelican can eat up to four pounds of fish daily and catch several pounds more if has young to feed. Next time you are near the Ocean, keep an eye out for these masters of the sky and enjoy their graceful air show, you won’t be disappointed! Badger (Meles meles) also known as the Eurasian Badger is recognizable for his iconic striped face and bushy flanks. Unlike his cousin the Honey Badger, he does care. In fact, Badgers are very fastidious, they line their well built burrows called setts with soft, dry grass which they clean and replace often. Badgers even build separate latrines for their special alone time. Known for being fierce, especially when protecting their burrows, Badgers are more often than not gregarious with others and enjoy the finer things in life. Badger, Alex Riley has spent nearly his entire life on or in the Pacific Ocean. He loves good gear, clean design and reading everything from the ancient classics by Homer and detective fiction by Dashiell Hammett. Growing up in Southern California with a sailing and surfing family, the ocean has been a dominate influence which lead to a twenty year career as a Marine Safety Officer. Camping trips on the beach in Mexico were just the begining in a search for waves that has taken Alex and a bag full of boards around the Pacific and Indian Oceans experiencing new places and cultures while looking for the best gear to go along.